Let’s face it, January has sucked for me. I’ve been sick with one crazy thing or another since (literally) New Year’s. So it’s time to start a project just because it’s going to cheer me up. So I’m going to make Kathy Doughty’s Avalon Quilt from Material Obsession just because. And I’m using a rainbow of colors to do it. AND, I’m going to try to machine quilt it myself. Take that, universe! 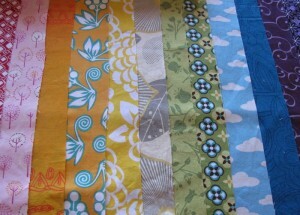 I’ve cut out my twelve 18″-blocks, and I’ll be using some white Kona cotton for the sashing. No idea what the back will be yet.